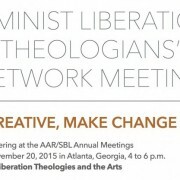 Feminist Liberation Theologians’ Network 2016: Save the Date! The next meeting of the FLTN will be held on Friday, November 18, 2016, at the AAR/SBL Annual Meeting in San Antonio, 4-6 PM. Please join us and please feel free to invite your colleagues and/or students to do the same. The topic will be Intersectionality and Political Action, a timely one shortly after the U.S. national elections. We will look at the kyriarchal structures that oppress and feminist theological resources that can be conducive of liberation. We hope to focus on concrete projects and groups that are engaged in these struggles. We seek speakers (for short presentations) who will articulate these matters. We welcome your suggestions. Please contact Mary E. Hunt (mhunt@hers.com) with your ideas. https://www.waterwomensalliance.org/wp-content/uploads/IMG_0920.jpg 1224 1632 waterstaff http://www.waterwomensalliance.org/wp-content/uploads/Screen-Shot-2018-11-01-at-12.15.34-PM.png waterstaff2016-01-27 13:56:502017-03-03 15:00:48Feminist Liberation Theologians' Network 2016: Save the Date!